BRYAN EATON/Staff photo. 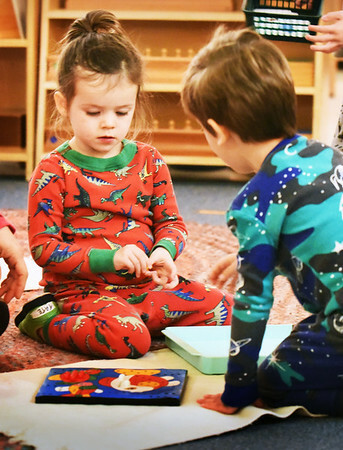 Tess Barrett, left, and Nolan Salski, both 3, put colored pegs into holes of matching colors on pictures of fish at the Newburyport Montessori School while wearing their PJ's. The school held Pajama Day to coincide with a drive to collect pajamas for the Pettengill House in Salisbury.